The clay/fibre mixture is packed into wooden forms made up of plywood attached to the Larsen Truss system. Whether the mixture is packed loosely or tamped firmly depends on the type of fibre (straw or wood chip) used in the mixture. 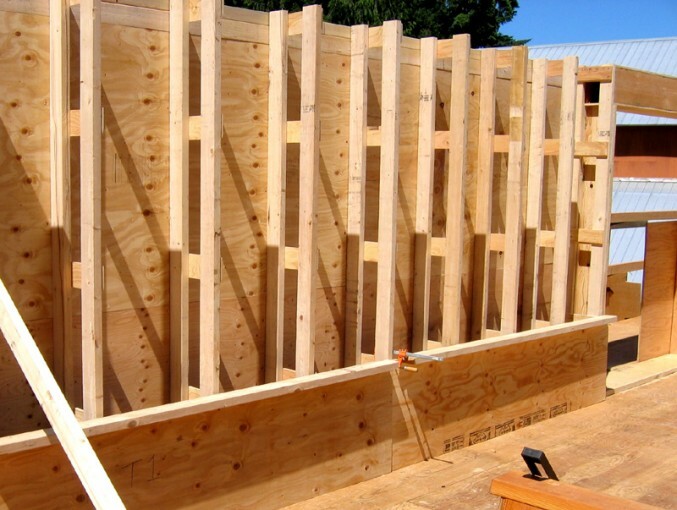 The exterior side of the wall is fully sheeted with plywood. The interior of the wall has 2′ of plywood attached to the bottom, creating the first cavity for the clay/fibre mixture. The walls are packed only two feet at a time to allow for proper filling in all the spaces of the walls, including around the windows. Different types of fibre can be used in clay/fibre walls. Straw mixtures are tamped, as the straw is hollow, and the air space inside of the fibre provides thermal insulation. Wood chip or wood shaving mixtures are loosely packed in the wall to allow for air pockets that provide the thermal insulation.